Even though Brussel sprouts are not a vegetable seen in Indian markets or at Indian tables, I have always been intrigued by them. Add to their unfamiliar nature the fact that they seem not to be very popular with little people and it was years before I tried them. It was a friend's casual comment about how they looked just like baby cabbages and even tasted just like them, that pushed me over the edge! I love cabbage and so figured I had to give Brussel sprouts a try. Don't be like me and let the fact that you've never cooked or eaten them, intimidate you from trying to cook them Indian style. You'll be missing out on the good stuff! 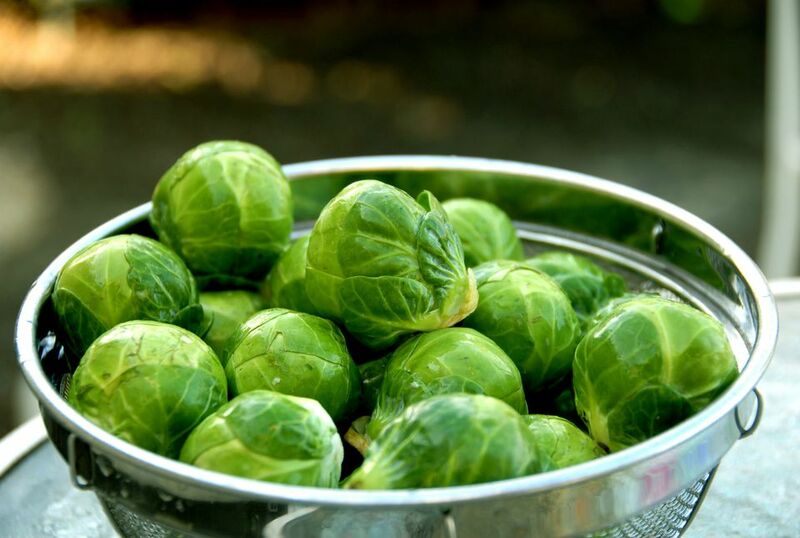 Since Brussel sprouts taste much like cabbage, they can be cooked just like it. The trick is to get small Brussel sprouts of similar sizes. Do not to overcook them or they lose their 'crispness,' nutritional value and pretty color. Serve Brussel Sprouts Ki Subji with hot Chapatis. Add a Daal dish and a spicy, tangy pickle, and you've got the perfect vegetarian meal! Wash the Brussel sprouts and pat dry. Cut the 'stem' off each one and peel off the top few leaves. Wash again if required. Cut each Brussel sprout into half lengthwise and then into quarters. Set up a wok or kadhai on medium heat. When hot, add the cooking oil. When the oil is hot, add the mustard seeds, green chilies, curry leaves and fry till the seeds stop spluttering. Now add the ginger and sauté for a minute. Add the tomatoes and cook till they are pulpy. Add the Brussel sprouts and then the turmeric, coriander, cumin, red chili powder and salt to taste. Mix well. Sprinkle with a little water. Cook the sprouts for 7-8 minutes or until done If the water dries up before the Brussel sprouts are cooked, feel free to sprinkle more water as required. Stir gently but often to keep the dish from burning. Do not cover the wok as you could end up overcooking the Brussel sprouts and they will lose their pretty color (and turn greyish!) and their nutrients. When cooked, garnish the dish with fresh chopped coriander and serve with hot Chapatis (Indian flatbread) and a tangy pickle.